#LAFFS: 50 CENT IS JUST A CLOWN... HE SAID HE NOW REMEMBERS WHERE HE KEPT HIS MONEY SO BANKRUPTCY IS OVER. 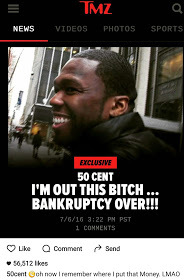 Curtis '50 Cent' Jackson says bankruptcy is over as he now remembers where he put his money.